Rio Tinto is expanding its remote controlled truck fleet in the Pilbara by retro-fitting older vehicles. Rio is planning to have 50 percent more haul trucks, or another 29 Komatsu and 19 Caterpillar vehicles, on line on separate operations by the end of 2019. The project at the Brockman 4 operation is scheduled for completion by mid-2019, allowing the mine to run entirely in AHS mode once fully deployed. That operation runs Komatsu. The company runs Caterpillar haul trucks at the Marandoo mine. The retrofit is the first time AHS technology has been deployed by the company on Caterpillar haul trucks. The project was expected to make a significant contribution toward Rio Tinto’s $5 billion productivity program said Rio Tinto iron ore chief executive Chris Salisbury. Rapid advances in technology was continuing to revolutionise the way large-scale mining is undertaken across the globe, Mr Salisbury said. “The expansion of our autonomous fleet via retro-fitting helps to improve safety, unlocks significant productivity gains, and continues to cement Rio Tinto as an industry leader in automation and innovation,” he said. “We are studying future additions to our autonomous fleet in the Pilbara, based on value, to help deliver our share of $5 billion of additional free cash flow for the company by 2021. Automation was helping to improve productivity and efficiencies across Rio Tinto’s operations in the Pilbara, Mr Salisbury said. “The retrofit programme will assist Rio Tinto’s iron ore business in delivering an additional $500 million of free cash flow annually from 2021,” he said. 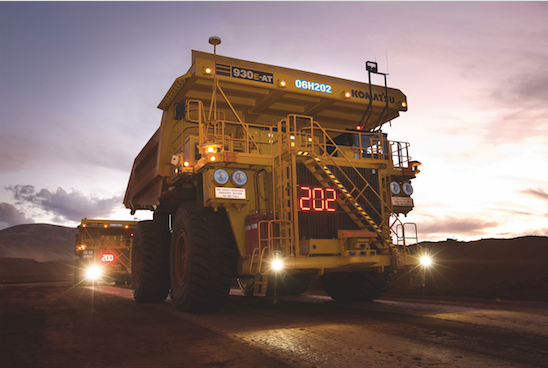 Last year, on average, each of Rio Tinto’s autonomous haul trucks operated an additional 1000 hours and at 15 per cent lower load and haul unit cost than conventional haul trucks. “About 20 per cent of the existing fleet of almost 400 haul trucks in the Pilbara is AHS-enabled,” he said.